The Doodlebops will be singing, dancing, and playing in their band at Sea World on Saturday, January 28th, 2012 as part of Sea World’s Just For Kids festival aimed at preschool-age children. The Doodlebops are based off of a children’s television series created in 2004 by the same name that was based out of Canada. The show features a mix of music, dancing, humor and skits that teach social lessons geared towards children. 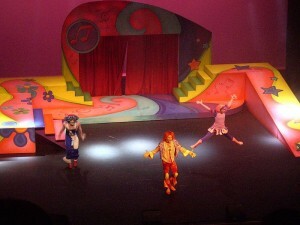 The Doodlebops band members wear a combination of heavy makeup and prosthetic’s during the show to look like live action cartoon characters. Click Here to find out more about the Sea World Just For Kids Event and here for some video of the 2012 performance in our forums. This entry was posted in Family and tagged concerts. Bookmark the permalink.